Excellence and Comfort in Central Manchester and London. Locations for therapy in London and Manchester are for your convenience and comfort. Both of high Importance to our clients at Health-Success. We understand that expertise in high comfort surroundings, ease of booking and confidentiality is paramount. Our clients expect a high standard of experience that we aim to provide. The very best application of therapies come within comfortable and luxurious surroundings in both Central Manchester and London. Personalised and cause-targeted NLP, Hypnotherapy and Havening® (Amygdala Depotentiation Technique) provide a combined, highly flexible and dynamic service that is offered in the comfort of our Central Manchester and Central London offices by the practice founder Diane Beck. Diane also provides the NLP Hypnosis therapy to business locations on request as well as via private Skype/Live Video Therapy sessions – please enquire using the form to the side for more information. Skype/FaceTime is of particular convenience to those outside the UK or unable to leave their venue to come into a Manchester or London therapy location. For Manchester appointments please call 0161 949 8182. For London Appointments please call 0207 118 3738. Please note: We accept no ‘drop-in’ clients. Appointments must be booked and paid for in advance directly via the therapist (terms apply). Availability for appointemtns vary on average between 3 and 4 weeks. Appointments can become available (please enquire about the waitlist when requesting your booking). 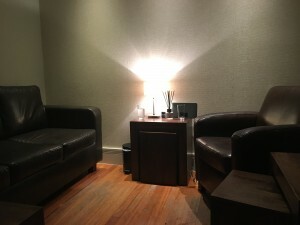 Our Luxurious, Secure and Modern Consultation Room in Central Manchester. Located in the beautiful, historic Grade II listed, Bridge Street Chambers building in Central Manchester. 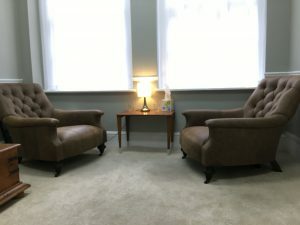 The Health-Success Therapy suite is unlike any other currently offered in Manchester for techniques available and for surroundings. The Manchester therapy office provides high comfort, privacy and modern facilities . A perfectly located central space, the beautiful Health-Success suite is designed for your travel convenience and a high-end therapy experience. Parking close by at Kendals, local Deansgate NCP car parks. Bus routes along Deansgate and Bridge Street. The Deansgate and Salford Train Stations are a short walking distance as well as many Metrolink Tram Stops in the city centre. Luxurious, Secure and Modern Consultation Rooms in Central London. 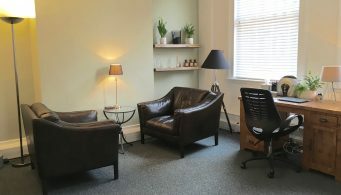 Located in Bloomsbury, Holborn, the therapy room is peaceful and centrally located. Close to Tottenham Court Road, Holborn Tube (closest) and Goodge Street Tube stations and many bus links. Street Parking available. Located on Crawford Street in the medical and Harley Street district, known for excellence in private therapy. This Central London location in the private medical district of London is well served by many transport links including Baker Street and Edgware Road Tube Stations and the bus routes along Marylebone Road. Havening, Hypnosis, NLP, TFT, EFT, Time-Line Therapy, Phobia Therapy, Weightloss Therapy, Confidence Treatment, Reiki, Light and Energy Therapy, and much more is available at this clinic. Providing supporting therapeutic change techniques that are solution-focussed means you can expect change work to be working towards the solution you want in as little time as possible so you can be where you want to be in your life sooner.